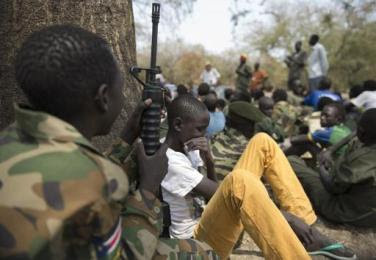 May 19, 2018 (JUBA) - Armed groups in South Sudan have released more than 200 children who have been serving as fighters, the United Nations Children Fund (UNICEF) said, amid estimates that there are some 19,000 child soldiers in the war-torn nation. The release of the 210 child soldiers, a UN spokesperson said, brings the total number of underage fighters freed so far this year to 806. Farhan Haq said additional releases are expected in the coming months that could result in more than 1,000 children being freed. Most of those released, he said, were from the armed opposition faction (SPLM-IO) while eight are from the National Salvation Front. The children and their families would be provided with three months’ worth of food, vocational training and education, Haq told reporters. The release of child soldiers, he added, was the third this year alone. According to UNICEF, more than 2,600 children have been released from armed groups since South Sudan’s civil war began in mid-December 2013. South Sudan’s civil war, now in its fifth year, started when forces loyal to President Salva Kiir clashed with those allied to his former deputy, Riek Machar. Tens of thousands of people have been killed and millions displaced as a result of the civil war.